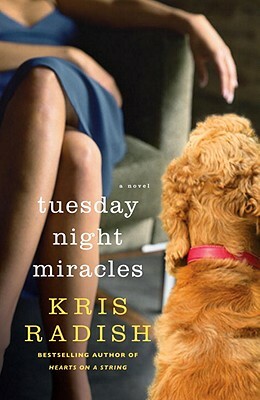 In this poignant and transformative novel, bestselling author Kris Radish weaves a tale of five women yearning for change—and the potential for happiness that lies within every heart. Free-spirited psychologist Dr. Olivia Bayer suspects she’ll need a miracle to help the four wildly different women in her anger management class. Grace, a single working mother, can barely find a moment’s rest. Jane, a high-profile real estate agent, is struggling in the recession. Kit, in her fifties, has had it with her taunting older brothers. And Leah, a young mother of two, is starting over after ending a troubled relationship. All have reached a crossroads, and Dr. Bayer has an unconventional plan to steer them on the right track. As the class gets taken everywhere from a bowling alley to a shooting range, the women’s Tuesday meetings transform from tense, reluctant gatherings into richly rewarding experiments in female bonding. As Grace, Jane, Kit, and Leah open up—revealing secrets, swapping stories, and recovering long-lost dreams—old wounds begin to heal, new friendships are forged, and miracles manifest in the most surprising ways. Kris Radish is the author of Hearts on a String, The Shortest Distance Between Two Women, Searching for Paradise in Parker, PA, The Sunday List of Dreams, Annie Freeman’s Fabulous Traveling Funeral, Dancing Naked at the Edge of Dawn, and The Elegant Gathering of White Snows. She lives in Florida.